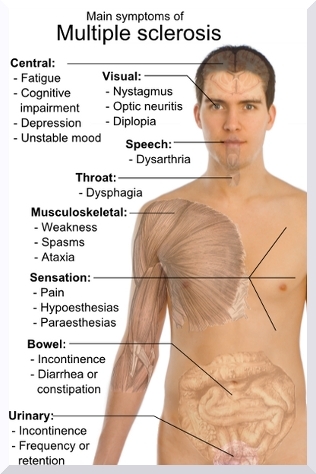 There are many signs of multiple sclerosis – the list is a long one. You can experience everything from optic neuritis to tingling in your toes and fingers. You can have several symptoms or just a few. What are the signs or symptoms? Read through the list and see if they sound familiar. Even if you do have many of the symptoms on the list, you still may not have multiple sclerosis. There are some conditions that can cause you to have the same signs or symptoms and as a result, cause your doctor to give you a misdiagnosis of MS.
You can have vision, muscle, nerve, mental, speech, bladder, or bowel problems. These would all be caused by inflammation of the nerves, specifically the myelin sheath. The damage or scarring to the nerves afterward is what brings about the problems associated with MS. If you feel you have any of the symptoms, talk to your doctor. If he or she suspects anything, they will refer you to a neurological doctor. The neurologist will give you a more thorough examination to see if you have MS. This is by no means a complete list of the signs of MS. If you have one or several of the symptoms in the list above, again, check with your doctor. Tell him or her your concerns. They will be able to decide if a referral is necessary. If you aren't satisfied with your GP's response to your concerns, get a second opinion. Sometimes general or family doctors don't know enough about the disease to make an assessment and decide you need to have further testing. A second opinion by a more knowledgeable physician may be the best route to take. If a second doctor, reaches the same conclusion, at least you will have peace of mind as to whether or not you have multiple sclerosis. Either way, time will tell, especially if you continue having the same signs or symptoms and they get worse. After another examination, a referral may be necessary to either rule out or confirm that you have MS.